Hint: You can the right mouse button to go back to the overview. And you can also use the left+right arrow button on your keyboard to browser the encyclopedia like a book. 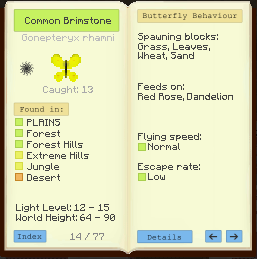 Now right click on your findings paper and you might get something like this. Hint: You can also make a present to your friends and give them high quality findings papers that you find. Getting 3 Fragments at once is quite rare. I am allowing people to port it. Two offered to do so, but no results yet. Anyone else that is sincere enough in his request can contact me for source code access. I know you probably won't let it happen but it'd be amazing if you would let someone port this mod to 1.12.2. 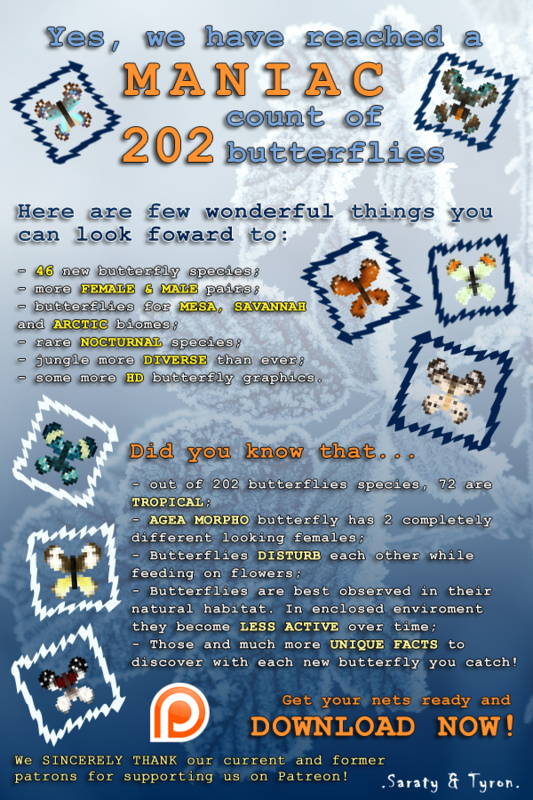 It is the best butterfly mod I've ever seen and would love to play with it in 1.12. I understand why you don't want to develop the mod anymore and why you most likely won't allow a port of it, but I figured I'd ask just in case you'd let someone do it. If you won't update it to 1.12.2, can I at least do so and use it in my modpack with credits? Ah my apologies. I didn't realize that people had asked but no one has posted anything yet. If no one else has posted anything I may try to take a crack at porting it later. I'm planning on taking a programming class next year in school if I have space for it. So hopefully I'd be able to apply that knowledge to java. Yes, I am one of those guilty of this. I have tried a few times to update it but i just dont know enough about java to get it right. I keep coming back to it like today, but just cant get far enough to make it run. I'm interested in helping. If anyone wants to put together a Discord, add me: AnacampserosRose#2856. Come on. I mean, man, Modpacks are to make you feel like your making your own game. If you really want to make your own game, why don't you just use the unreal engine or something. We are making Modpacks because it's much easier than actually programming a game. I did use a small public domain voxel engine as a basis. I also did start a "your own game" thing through modding with Vintagecraft, but after 2 years working on it it felt way to limiting, unsupported and tedious to keep up with the constant api changes. Using my own engine now, I'm like 3 times faster in adding new game content. If you port this mod I'd love it if you could post it to curseforge for everyone to enjoy. 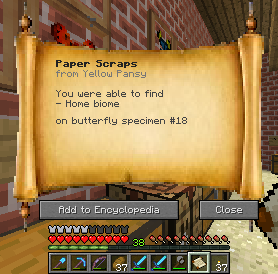 lol, discovered your butterfly mod two days ago looking to add life to the minecraft server I run for my friends. And now I find out you've made the only minecraft clone that looks any good. i was really excited for this mod but i only have 1.12.2. will you please make an updated version! if it works i have 8 other ppl i'm willing to share it with who i know will download it for sure! Thanks and keep up the good work!